With Icotek's CONFIX conduit routing components, cables can be easily routed inside parallel corrugated cable conduits. 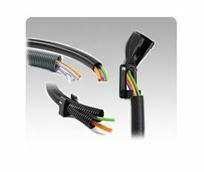 They are perfect for machines, control panels or enclosures to ensure a maximum cable protection. The CONFIX product range consists of bulkhead fittings which are angled at 90°. The 90° angled bulkhead tting CONFIX FWS is for installation of parallel corrugated cable protection conduits, for example in machines, control panels or control cabinets. The liftable cover is tightly fixxed by a hinge to the mounting box. The system is therefore very easy to handle. Corrugated conduits CONFIX WS for cable routing are used where cables have to be protected from mechanical damage or certain weather conditions. Conduits from size NW 13 can be mounted with the bulkhead fittings. Parallel corrugated conduits are available in three different materials and in colors matching with the bulkhead fittings. In addition, Icotek offers split corrugated conduits CONFIX WST for routing pre-terminated cables and corresponding conduit clips CONFIX SH.